I am so excited that the voting for the Food Ninja contest has begun. Three fantastic food bloggers put out a call to all Food Ninjas (basically anyone who does anything rad in the kitchen or with food), and the voting has begun! I entered a Food Ninja video, showcasing my bento making skills. Here is the video, I hope you like it! I had so much fun making this video and the resulting bento. My 10-year old stepdaughter did the photography/filming at the farmers market, and I made my hubby do the "unsolicited" testimonial at the end. The Japanese subtitles say silly things like "Don't Try This At Home" and "My Wife Is Crazy!" I filmed each of the video segments while speaking German, just to make sure my overdub wouldn't match my mouth. It took about 3 days to put this together. And serious thanks to Sheri of Happy Little Bento for her inspirational Ninja Egg. Sheri rocks! 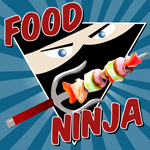 You can head to lafujimama.com right now and vote for the best Food Ninjas in each category. I would really appreciate a vote for Sonoma Bento in the video category. And you can vote for other bentoists as well! Debra of hapabento entered in the blog category, and Sheri of Happy Little Bento entered her awesome Ninja Egg bento in the picture category. Voting ends on Saturday, October 30th so please head over now to vote. And just for fun, here is a Froggie Bento I made for my stepdaughter this past summer. I got the inspiration to make it from the Yum Yum Bento Box book by the wonderfully talented Pikko and Luckysundae. 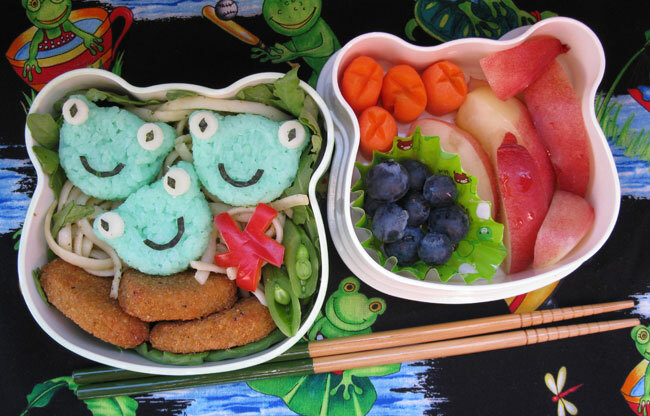 It's similar to another Froggy bento I made at the same time, but just slightly different. Have a great weekend, GO GIANTS! Oh..such a nice video you have made!! A BIG smile on my face while watching it. Well done!! Sure will vote for you. Gambateh, all the best!!! Love the froggy bento too..cute and beautiful. You are a food ninja for sure; and the dubbing is over the top FUNNY. Thanks for the shoutout; and may the ninja prevail! Your video is hilarious! I giggled and laughed throught he whole thing, and of course voted!!!!! I voted for all three of of you wonderful bento women! 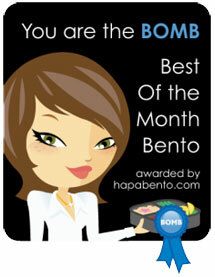 Yay for bento artists sweeping the Food Ninja contest! Thank you Emily! I had so much fun making the video. Ha ha, thanks sheri! I was cracking myself up after each take. Oh thank you, Lia! I am so glad your kids liked it too. Good photography for a 10-year old, too.